Arriving to the museum last Saturday morning, I ride up the elevator with a young woman who appears to be jogging. Are you out … for a run? I ask her. She is. It’s colder than I thought it would be, she tells me. And you came to the museum? She nods a yes and goes on to say … to warm up and maybe look around. In the 2 trips I have made here – between the conversation in the museum with both visitors and docents, and in the city – I get the sense that the museum is a part of regular life for the local community. I return to Bentonville to take part in a Symposium at Crystal Bridges. The panel I present with focuses on Science in Artistic Form (I’ll talk about this another time). This is one event in many. 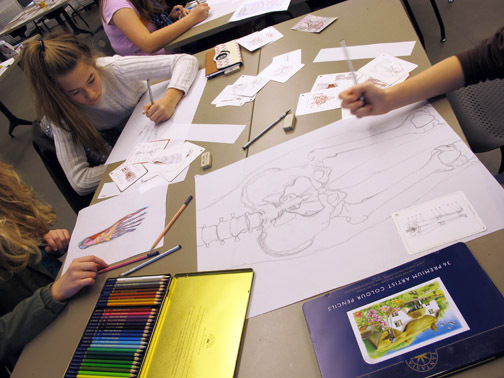 I also teach an anatomy drawing workshop for teens. After the symposium on Friday night, I meet a couple who visits the museum regularly. We have a long talk about the facility and its various activities. Their daughter hoped to take my workshop but it sold out. I suggest they contact the museum and while I can’t give her a firm invite, I tell her I am open to more participants. I like the synergy of a large group. The next morning they arrive with their daughter. She attends the workshop while her parents attend the rest of the symposium. A few others join us. When everyone signs in I learn the group comes from all the surrounding areas. I walk into the studio to find a few artist anatomy books. Influenced by medical illustrations, I am more than excited to see that we also have one of the museum’s rare books on hand – Medical Anatomy; Illustrations of the Relative Position and Movements of the Internal Organs , Folio Size, 1869, by Francis Sibson. Earlier when I learn the museum owns this book, I ask if we can have a special showing. I explain to the class this is a rare opportunity. Anatomy! 1869! 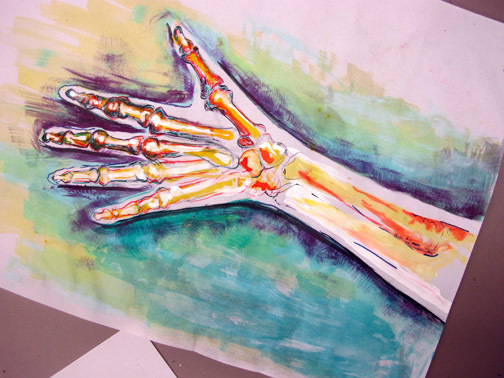 Hand-colored lithographs! I talk about my work and explain how we’ll proceed with the afternoon. I show one sample of a drawing and pass out postcards of my artwork – one to each participant. I explain general process including use of color. I note that while I do look at artist anatomy books, most of my references come from medical anatomy and Yoga study sources. I mention I have a full human skeleton which is part of the video I end my introduction with. I pass out flash cards that include skeleton and muscle diagrams – and we begin. The next 3 hours – we work out anatomy of their choosing. Class ends just as rain begins to fall in the small lake in front of the classroom. Here are photos of the productive afternoon. A special thanks to Lori, an art instructor at Crystal Bridges, who helped me with the workshop. The purpose of the museum is to educate and build community – I’m glad to be a part of it. To go to the State of the Art website, click on the image above. The focus of this assignment – structure and texture, parts and surface – of the forms. Students also take time to consider the placement of subject matter into the picture plane. They construct a composition and balance out positive and negative space. Everyone picks their shells, magnifying glasses get pulled out. The work to look at structure and define texture begins. They look closely. They see. They identify. They put it down. Emotions run high. Throughout the assignment we discuss stylizing. In this assignment students learn to see the space between things. All the drawings are strong, because contrast is naturally enhanced in the composition. Some works are simple and express a less is more sensibility, while others are like a series of complex pathways. Note the subject-matter stands out, and so does the space between the leaves, stems and flowers. Kristine, a Native American student, responds to Izzy’s study below, in a personal way. She tells us it reminds her of a place on the reservation where there are many hand impressions left on rocks, from over 200 years ago. Or did she say 2000? Ancestors placed down the palm of their hand against the rock, and blew powdered pigments through hollow tubes over the form. A ghost print remains of the activity. We enjoy a productive critique. And though the group has just learned the concept of negative space, they will develop and understand its use with each assignment. They’re supportive and constructive in their commentary today. New semester, new students, new contour studies. I thought I wouldn’t be able to do this. I was surprised by my patience. I am happy with the drawing. I’ve never done something like this. I usually have more…you know…not so many rules.. I especially appreciate that last comment. The first assignment is a contour study of a complex object. Some students do more than inner and outer contour. They start to add texture. I don’t believe in stopping progress so I let it them go a bit. The nervousness for the majority of the class comes from the complexity of the subject-matter and the use of marker. The assignment is such a valuable lesson, working slow and careful and developing patience. Learning to see the edge and translate it into a smooth flowing line and finally creating a flowing composition. Here are a few samples of some of the completed works. The second semester students have other concerns, though they still have to emphasize contour lines. If they’re inclined they can take the general lesson out into the world – slow down, think carefully, do mindfully.